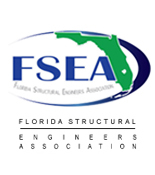 "The Florida Structural Engineers Association (FSEA) was formed in 1996 to enhance the profession of structural engineering in the state of Florida. FSEA provides input and leadership on building codes and their enforcement, sponsors technical seminars and roundtable discussions, and organizes informal mixers to facilitate networking between peers. FSEA’s goal is to join together all Florida structural engineers and to address common concerns of the profession." FSEA is a member organization of the National Council of Structural Engineers Associations (NCSEA). The website of NCSEA is http://www.ncsea.com. The University of Florida student chapter of FSEA was established for the purpose of providing liaisons between students and working professionals in the structural engineering field. Every semester, the student chapter provides various events like site visits, speakers from the structural engineering industry, workshops for technical software, and professional development seminars like the Annual Roundtable.